This article takes a look at the seller’s listing agreement. By entering into an exclusive right-to-sell listing agreement, an owner of real estate employs a broker to locate a buyer for his property. The right-to-sell listing agreement grants the broker sole authority to market the property, locate a buyer and negotiate a sale. It also specifies the fee amount the seller agrees the broker is to receive and the conditions which must be met by the broker or acted on by the seller for the broker to earn the fee. The exclusive right-to-sell listing agreement, first tuesday Form 102, is used by brokers and their agents who seek employment by a prospective seller of real estate. It is prepared and submitted as the broker’s offer to act as the seller’s exclusive real estate agent to market the seller’s property, locate a ready, willing and able buyer and negotiate a sale. In exchange, the seller promises to pay a fee on any sale of the property during the period of employment. Formal documentation of an obligation to pay a fee – a written agreement signed by the seller – is the legislatively enacted and judicially mandated requisite to the right to enforce collection of a brokerage fee from the seller. Also, the seller’s listing agreement and its addenda serve as a checklist for the contents of a listing package or marketing package on the property to be handed to prospective buyers to review. The package contains information about the property known to the seller or the broker and his listing agent. The marketing process requires information about the property to be handed to prospective buyers before they enter into a purchase agreement with the seller. Brokerage services: The employment period for rendering brokerage services, the broker’s due diligence obligations and any advance deposits by the seller are set forth in sections 1 and 2. Brokerage fee: The seller’s obligation to pay a brokerage fee, the amount of the fee and when the fee is due are set forth in section 3. Conditions: The broker’s authority to receive a purchase offer, accept a good-faith deposit, enter into fee-splitting arrangements with other brokers and enforce the listing agreement is set forth in section 4. Property description and disclosures: Identification of the listed real estate and personal property, the terms of existing financing and the conditions of the property are set forth in sections 5, 6 and 7. Sales terms: The price and terms sought by the seller for the sale, exchange or option of the property are set forth in sections 8, 9, 10 and 11. Signatures and identification of the parties: On completion of entries on the listing form and any attached addenda, the seller and the broker (or his listing agent) sign the document consenting to the employment. The following are instructions for Form 102. Enter the date and name of the city where the listing is prepared. This is the date used to identify this document. Listing start and end date: Enter the date the brokerage services are to commence. Enter the expiration date of the employment period. The expiration must be set as a specific date on which the employment ends since an exclusive listing is being established. 1.2 Broker’s/agent’s duty: The broker and his agents promise to use diligence in their effort to locate a buyer for the listed property. The agency duties a broker and his agents owe the seller are always implied, if not expressed in writing. Advance fees and costs: Enter the amount of deposit negotiated to commence the brokerage services. b. Fee on withdrawal: States the brokerage fee is earned and due if the seller, without the broker’s consent, withdraws the property from the market or significantly interferes with the broker’s ability to market the property. c. Fee on termination: States the brokerage fee is earned and due if, during the listing period, the seller terminates this employment. 3.2 Replacement property fee: States an additional fee is earned and due, based on the same terms as the fee for a sale of the listed property if, through negotiations involving the broker, the seller acquires replacement property, such as occurs in a IRS §1031 tax-exempt transaction. 3.3 Hourly fee: Enter the negotiated dollar amount for the broker’s per hour fee. The hourly fee is earned for time spent on behalf of the seller if the property is not sold, exchanged or optioned after a diligent effort is made to market the property and locate a buyer. 4.1 For Sale signs: Authorizes the broker to place For Sale signs on the property and publish information (in multiple listing services (MLSs), classified ads, broadcasts, flyers, etc.) regarding the property described in the listing. 4.2 Authority to share fees: Authorizes the broker to cooperate with other brokers and share with them any fee paid on any transaction. 4.3 Authority to accept deposits: Authorizes the broker to work with buyers to obtain offers and receive good-faith deposits. 4.4 Handling offers: Authorizes the broker to deliver offers from buyers to the seller in person, by electronic transmission (fax or email) or by mail. 4.6 Attorney fees: Entitles the prevailing party to attorney fees if litigation results from the seller’s failure to pay fees or the broker’s breach of an agency duty. 4.7 Choice-of-law provision: States California law will apply to any enforcement of this employment. 5.1 Type of real estate: Enter a brief description of the type of real estate to be sold, such as apartment, commercial, office, industrial, land or single-family residence (SFR), its legal description or common address, and the vesting of its title. Loan information submitted to the MLS or included in a marketing (listing) package gives a prospective buyer the alternative of making an offer which includes the existing loan as part of the purchase price. 6.2 Encumbrances: Enter the balance, terms of payment, interest rate, due date and the name of the lender on any financing secured by the personal property. Listing package addenda: Check the appropriate boxes and attach each addendum to be prepared or reviewed by the seller for inclusion in the listing package. The addenda will contain the seller’s representations about the property needed by the broker to properly market the property to locate and induce prospective buyers to purchase the property. Editor’s note – The Agency Law Disclosure is mandated to be included in the seller’s listing agreement under penalty of a lost fee on the resulting sale if not included at this time. The applicable federal and California residency and withholding disclosures are also most prudently presented at the listing stage since the information is known to the broker and might be of financial concern to the seller. The other addenda listed are disclosures about the property which are prepared by the seller and received by the broker to be included in the listing package for delivery to prospective buyers so they will be informed of the property’s condition before the seller accepts an offer or makes a counteroffer. 7.1 Check the appropriate boxes and attach each addendum prepared by the broker and reviewed with the seller to disclose the costs the seller will incur on the sale of the property. 8.1 Price/terms sought: Enter the dollar amount of the price sought for the property by the seller. a. Cash price: Check the box to provide for the price to be paid in cash on closing. The seller is to discharge and clear all liens from title, either himself or through escrow. b. Loan assumption: Check the box if the seller will allow a buyer to pay a cash down payment (to cash out the seller’s equity) and assume the loan(s) referenced in section 5.2.
c. Carryback financing: Enter the amount of the down payment the seller will accept. Enter the amount of any existing financing the seller will allow a buyer to assume. Enter the amount, terms of payment, interest rate, the number of years for monthly amortization payments and the due date for carryback financing the seller will accept from a creditworthy buyer. 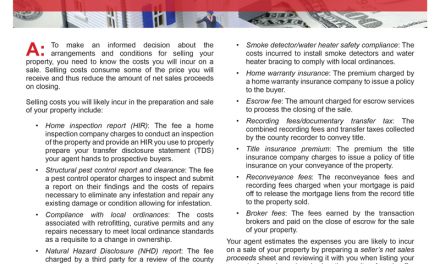 8.2 Sale and closing costs: Check the box for each item of expense the seller will incur to market the property. Prudent practice dictates the seller proceed to promptly prepare disclosures and authorize the inspections, reports or clearances needed for the broker to properly market the property and inform prospective buyers about its condition before the seller enters into an agreement to sell the property. 9.1 Acquisition property: Enter the type of property, its location (city, county or state) and the dollar amount of equity and debt on replacement property the seller is willing to acquire with the net proceeds from a sale of the listed property or by an exchange of its equity. 10.1 Seller will option: Enter the amount of option money the seller would accept to grant an option to a buyer. Enter the period during which the option may be exercised. 11. Other terms: Enter any special provision to be included in the listing. Broker’s/Agent’s signature: Enter the date the listing is signed and the broker’s name. Enter the broker’s (or agent’s) signature. Enter the broker’s address, telephone and fax numbers, and his email address. Seller’s signature: Enter the date the seller signs the listing and the seller’s name. Obtain the seller’s signature. If additional sellers are involved, prepare duplicate copies of the listing agreement and enter their names and obtain their signatures until all sellers are individually named and have signed. Enter the seller’s address, telephone and fax numbers, and his email address.